Taupo is a town on the shore of Lake Taupo in the centre of the North Island of New Zealand. It is the seat of the Taupo District Council and lies in the southern Waikato Region. 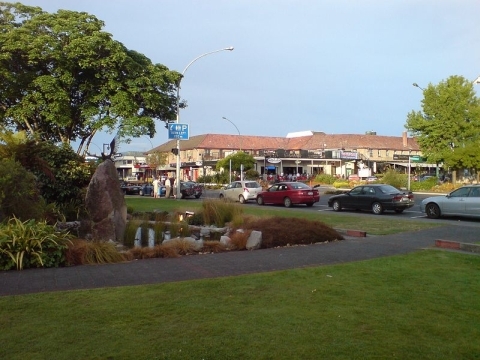 Taupo has a population of 22,000 (June 2008 estimate). In 1953, Taupo was officially constituted as a borough, but from 1989 it has been administered by the Taupo District Council, the district including both Taupo itself and the surrounding hinterland. Despite this, it is occasionally referred to as a city. The name Taupo comes from M&3257;ori Taupō-nui-a-Tia. Literally translated, it means "The great cloak of Tia" where Tia is the name of the discoverer of the lake. In 2009 a team of Taupo citizens won the TV2 programme Top Town. Taupo is located at the outlet of Lake Taupo, New Zealand's largest lake, in the north-east corner of the lake where it discharges the Waikato River. The river flows over one of New Zealand's most spectacular waterfalls, Huka Falls, a short distance north of the town. Taupo is a centre of volcanic and geothermal activity and hot springs suitable for bathing are located at several places in the vicinity. The volcanic mountain of Mount Tauhara lies 6 kilometres (4 mi) to the east. Taupo is situated on a stretch of State Highway 1, running concurrently with State Highway 5. It is situated 53km North of Turangi. It is one of the few centres in New Zealand that were never linked to the rail network. The small but growing satellite town of Kinloch, where a Jack Nicklaus golf resort is being constructed, is 20 kilometres west along the lake. It offers a number of tourist activities including sky diving, jet boating and paragliding. Taupo services a number of surrounding plantation pine forests including Kaingaroa Forest, the largest manmade forest in the world, and related industry. A large sawmill is sited approximated 3km to the north east of the town on Centennial Drive. The Wairakei geothermal power station is a few kilometres north of the town. Taupo has three high schools: Tauhara College, Taupo Nui-a-Tia College and the private Lake Taupo Christian School. 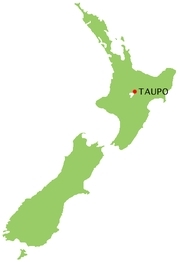 It also has Waipahihi, Hilltop, Mount View, Taupo and Tauhara primary schools, and Taupo Intermediate School. Since the mid-1990s Taupo has become increasingly popular as a venue for major sporting events, increasingly of an international nature. The town's compact size, clean environment, central location and supportive council and community have been cited as the reasons for this. Taupo is served by State Highways SH 1 and SH 5, and the Thermal Explorer Highway touring route. All three highways run concurrently for 11 km from Wairakei in the north, along Tongariro Street and Lake Terrace, to southern Taupo. Taupo is one of the few towns in New Zealand that have never had a link to the national rail network, although there have been proposals in the past. Taupo Airport is located south of the township. The airport is served by Air New Zealand subsidiary Eagle Airways, with direct flights using Beechcraft 1900D aircraft to Auckland and Wellington.